The first step in the journey to digital comics is to figure out what you’re going to read them on. These days, the answer is pretty much going to always be “a tablet”… but which one? I had a quick look at the market back in late 2011 and here’s how I made up my mind. First, I focused on the main ~10 inch tablets of the market. This included, for instance, the Motorola Xoom, the Asus Transformer and the Apple iPad 2. You may have noticed that, a couple months ago, I bought myself an iPad 2 as an early Christmas present. This was the result of some market research based on a few requirements I had for my next big household change: transition from paper comics to digital comics. 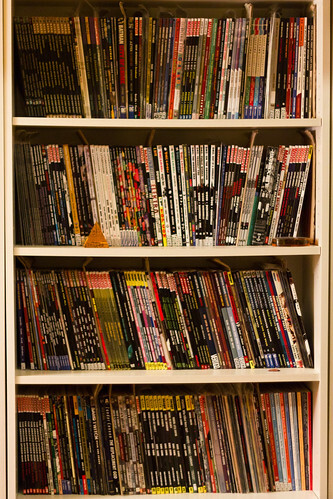 The incentive to start reading digital comics was pretty obvious: after moving my music, movies, TV shows and books to the digital world, it was only a matter of time before I would do the same with my comics. Sure, just like I still like to own some books in physical form, I will still buy some of my comics at my friendly local store, but, realistically speaking, more than two thirds of my collection is just enjoyable stuff I don’t care so much about – I want to read it, but the book itself is not especially beautiful, and it’s not something that would impress my guess when they spot it on the shelves. For me, going digital is all about reclaiming space and uncluttering the house where it makes sense. Edit: it turns out there’s a lot more to say than I expected, so I expanded the series a bit.